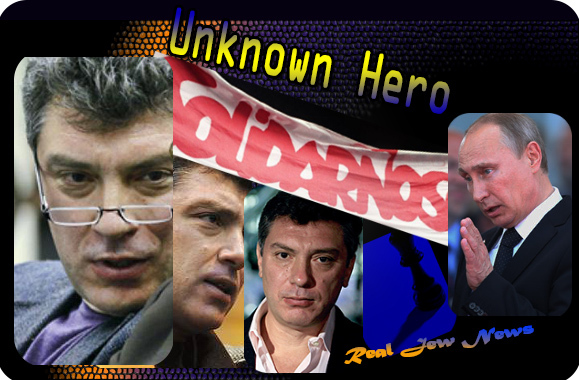 DID YOU KNOW that Boris Nemtsov, a so-called “rival” of Putin, who was recently murdered in Moscow, was unknown to most Russians? Not only was Nemtsov unknown, he couldn’t even manage to get elected as mayor of Sochi, winning a mere 14% of the vote in the city’s 2009 mayoral elections. No surprise there, since the “opposition” Solidarnost party, which united the Jew ‘chess king’ Kasparov with Nemtsov, had the lowest number of supporters - 5 percent. According to a recent Levada poll, only 1 percent of the Russian population trusted him just prior to his death. Nemtsov’s insignificance grows as one looks at the facts. With his reputation tarred as a Yeltsin-era politician, Nemtsov, (for those who even knew of him) was associated with images of societal collapse and corruption. Who can deny, says Lyndon LaRouche, that Nemtsov was thoroughly discredited by his role in the Yeltsin administration when Western speculators (Jews) looted Russia? One can argue that Nemtsov as a powerless opposition figure was an “asset” to Putin who enjoys a whopping 87% approval rating. 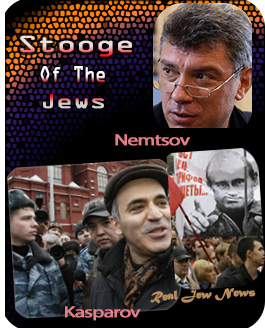 But was Boris Nemtsov a better “asset” for the Jews who run the US State Department then he was for Vladimir Putin? THAT’S the question. NO ONE IN THE OPPOSITION bought the unlikely story that Putin was behind the murder of Boris Nemtsov. In fact, the opposition cancelled their political rally and staged a memorial march instead. Every Jewmedia venue finger pointing at Putin for Nemtsov’s death really does have three fingers pointing back to the Jew-infested US State Department. Here’s a video of Nemtsov beating feet to meet with the new US Ambassador to Russia, Michael Anthony McFaul, just after McFaul took office in January 2012. 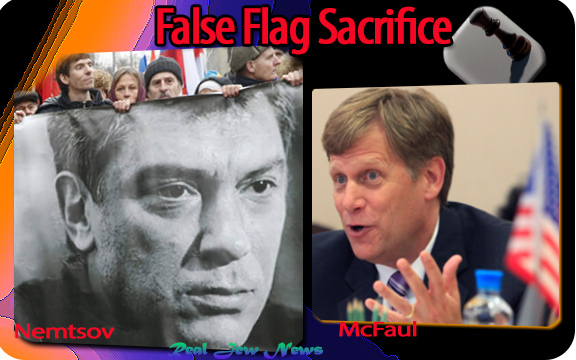 On January 17, several opposition figures, including Nemtsov, arrived at the US Embassy on McFaul’s second day on the job to ostensibly make a pre-arranged meeting with visiting American official, Deputy Secretary of State William J Burns. This was two months prior to the 2012 Russian presidential election held in March in which Putin was elected for the third term starting May 7 2012. It’s well understood both in Jewmerica and Russia, that McFaul was to facilitate a ‘color revolution’ in Russia from day one. And the “opposition groups” were out in full array during the election campaign complete with US-made posters, banners, and US State Department’s poster Jew, Gary Kasparov. PUTIN GAVE warning in February 2012 of an opposition false flag sacrifice. It was the ill-omened fate of Nemtsov to be that ’sacrifice’ on this past February’s last day. “A sucker is born every day,” said circus magnate PT Barnum. But in the circus run by the JEW-S State Department, a stooge breathed his last on a Moscow bridge on February 28, 2015. This makes TWICE in a row that the JEWS have failed in their ‘regime change’ plans. First, in Kiev, with Nudelman handing out cookies in the Maidan, unknowingly (the stupid Christ-killing Jew) handing Crimea to Putin…a MAJOR geopolitical change in the Jew-failing game. Second, attempting a regime change again with using Nemtsov as a useful stooge in with the “Russian Maidan” demonstration after Nemptsov’s murder attempting to make him a martyr and blame Putin for this death. DIDN’T WORK! Even Netsov’s party leaders didn’t buy it! NEOCON JEWS like Nudelman, her FATSO JEW husband, Robert Kagan, and all the rest of the (say it Paul, say it Gerry, say it Saker) Neocon JEWS are GNASHING THEIR TEETH just like they’ll be doing in HELL where ALL the Neocon Jews are headed. If so, I need help FINANCIALLY to continue. I can no longer produce my Videos on a weekly basis. The funding I get FROM A FEW will have to be spread out to only one or two Videos per month as it now stands…UNLESS serious funding comes in. THUS, I am FORCED to consider borrowing money from Credit Cards once again, JUST TO STAY ONLINE. IF YOU LIKE MY ARTICLES & VIDEOS…I NEED FINANCES TO CONTINUE! Why does Putin not take the bold initiative and nationalize all the assets that were highjacked by the Jews during and after Yeltsin’s time? Seems to me a quick fix to stop the looting process and preserve the assets for the Russian people. Netanyahu speaks the name Moses in his recent preaching to US lawmakers! The ignorance and gullibility of even honest Americans is astounding! As always, a very insightful/investigative report on Nemtsov murder. Also, glad to see you’re back in action. Prayers for good health and stamina and much fruit while evangelizing in NYC! The usual criminals headquartered in London, NY and TA are trying to destabilize Russia and bring about regime change with a view to gaining control over Russia vast and limitless natural resources. This is the real reason for the coming war. The usual criminals (clearly identified on this website) nearly achieved this goal in 1917 with their mass murdering Bolshevik machine but then lost control of the experiment. In 1992 a 2nd opportunity arose under the likeable clown Yeltsin but then this mysterious ex-KGB colonel appeared from nowhere and thwarted their plans. To be lucky third time will require a major military conflict. Ukraine is only a dress rehearsal and the looting there appears to be well advanced. Peace there is, in any event, impossible since it would require Russia accepting Ukraine’s integration into NATO, Sevastopol becoming a US naval base and ABM missiles being placed on Russia’s border. No country will accept this but in any event it will make no difference since the ultimate goal is Russia not Ukraine. M.S.M. is fast losing all credibility thanks to the internet and hopefully this will be the 1st war where the FALSE NARRATIVE of the Empire of the Anglo-Jews becomes fully visible. There can be no more powerful disincentive to war than the masses being exposed to the truth. Keep it up, Brother Nathanael! I’m happy to see you back in the thick of the action again. I continue to pray for your continued good stamina, so that you’ll be able to continue the Lord’s Mission. This is also the reason behind my financial contributions. Just imagine a thousand or more readers contributing $40/month; that’s $40K. I know there are a goodly number who could contribute $100, $200, or more a month but don’t. Why they don’t, only they know. I’ve read about the murder of Boris Nemtsov, Brother, and I agree with you 100%. There’s no way that Vladimir Putin would be behind this murder; that Jews (Khazarian Mafia members) in the State Dept. were totally behind it, especially Victoria Nudelman and her husband, Robert Kagan. She hates Putin enough to pull that false flag slaying and blame him. Like you, I believe she and her cohorts made a huge mistake in having Nemtsov killed; since the opposition didn’t believe Putin had anything to do with the murder as well. You certainly nailed it perfectly. Oops! Media was dead wrong about Nemtsov murder. 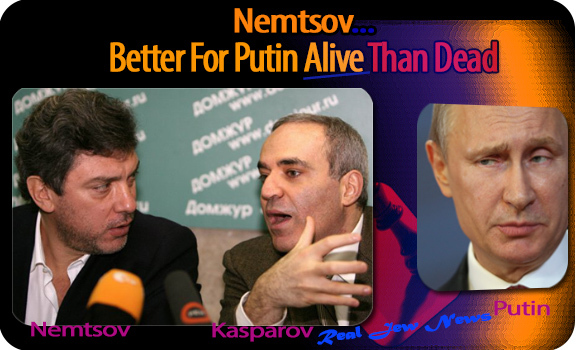 Nemtsov killed by radical Muslims (Jew stooges), not Putin fans. A Muslim extremist did it! Who dare deny it in public without compromising similar dubious claims like Sandy Hook and the others? Thats the convenient deft answer from Russia! Everyone suspects who did it and who did not do it, but if us poor Muslims can do a Charlie Hebdo, what can prevent us from doing a Boris ? Now I can hear Jewish teeth gnashing. Putin is smart enough not to make a martyr out of a Jewish opposition leader. Given this assertion the question is raised — who benefits from framing Putin? I’m having a little trouble buying the “radical Muslim” did it angle. The story is barely stronger than the Western version we’ve come to know and “love”. However, it seems likely that the character and his cronies needed rounding up and two birds were killed with one stone. It is a good move keeping it well clear of President Putin and also serving it up as an exasperating checkmate once again. As a Muslim, I don’t think we have that much left to lose, so not that worried; and Russia can use those Takfiri extremists and Salafis for anything including target practice for all most of us care. I think I have discovered the code word to deal with the JDL thought police and awaken the general American public. It is about the only effective term that doesn’t cause the audience the glaze over and allow the anti-Semite accusation to work well. You will not be automatically tuned out with this one. The recipient reaction is at minimum curiosity and even tacit agreement. With the recent Bibi dog and pony show, and Israel’s foreign minister calling for Arab beheadings, the time is ripe for “Israel Firster” labels. ‘The Moscow Basmanny Court, on Sunday, sanctioned the detention of three additional suspects in the case of the murder of Russian politician Boris Nemtsov. Meanwhile, Daur Dadayev , a former Chechen officer pleaded guilty for his involvement. Yes, 21st Century Dragonslayer, this “Israel Firster” term is an effective approach. I myself have used this term many times on Yahoo and Hotmail articles pertaining to the hypocrisy of Israel and US support of it via AIPAC, ADL and like mind lobbies who purchase our so-called politicians whether being Dem’s or Republicans. I use this term in our fight to open eyes and hearts to the situation that is so obvious to people who are true to themselves and realistic. We are truly in dark times yet like the Bible says–people will be hard of heart and blind to the evil in front of them. I believe in this approach and such, because it’s good to direct a person to the light through the window. Yet that person really needs to see for himself the details when looking out and maybe lead him ultimately to this sight and seeing Brother Nat’s point of view, because you can’t push anyone to see what they won’t want to see. I think it’s good for many of us to spread the word through blogs on mainstream media who lie and are owned by these same guys pushing 1st world countries troops like US to die for Big Banks, Big Lies, Military-Industrial Complex and Israel. Many people fight back and spread misinformation, yet if we can get through to some, that is great. I also believe that many people say nothing and keep quiet and let US and Israel do what they will because they want to see some kind of end of times miracles or they believe this is the Rapture. I think AIPAC, the Rothschilds love this as they use this to their benefit. Remember the AntiChrist moves in multi-faceted ways and he is very strategic. I believe it is very possible we are in end times with all the symptoms of it, yet I’m not an absolutist and like God says, not even the Son will know the time of His coming, only the Father. I think it is possible that there will be dark times for many years, even hundreds, and He will delay coming. Then people will start to doubt because they believed so much that it will happen now and so quick. This tests our true faith….take care all. I’m broke. Very few are donating to me. It is amazing how often these False Flags fly in quick succession. They are not particularly effective it seems. Obviously Mr. Putin can ride this one out easily considering the facts concerning Nernstov. The Jews, Masons and Jesuits derive their evil beliefs from the ancient mysteries of Babel. Egypt and Babylon flourished as societies with this ever-increasing occultism and Phallus worship as the base. The Kabbala that they follow, knowingly or unknowingly, is the font for their deeds. Christians who cover for the Zionists and Kabbalists are Anti-Christ. They follow an End-time belief from Darby that is Anti-Christ. Beliefs in a Millennium, Armageddon, seven years’ Tribulation, a Rapture restoration of a Temple and sacrifices of animals is contrary to the whole of the Scriptures. It would be wise to cease viewing the programs of all the Television Evangelists of America as obviously they all follow and proclaim this Anti-Christ doctrine. ‘Be careful of the yeast of the Pharisees and Sadducees’. The latter went into oblivion but the former are alive as Zionism today. Their yeast is poison. No one knows how the end will be nor when it will be. We are to ‘occupy’ until then. In doing so, unless events occur otherwise, we trust the revival of Russia as an Orthodox Christian nation will lead to a defeat of all the False Flags and the U.S. Jewish building up of armies in the vicinity of the Russian border. That small financial help should reach you tomorrow, Brother. There was a difficulty. One does hope many will respond to your plea for help as millions are blinded and need to have their eyes opened. Excellent Article on the real (miniscule) significance and standing of Nemtsov and opposition parties and leaders in the world of Russian politics, and the obscure fact that the murder was so obviously a false-flag provocation set up that even the organizers of the opposition political rally immediately called it off, requesting to hold a simple memorial procession instead. I notice the “Maidaners” within the opposition persisted in making it a political rally after all. In any case, the Jewish Daily Forward, spilled the beans on who actually composes much of the liberal opposition leadership in its latest obsessive compulsive hand-wringing expression of Jewish narcissism and self-absorption. To many Russian Jews, the murder of Nemtsov — a physicist turned liberal politician, born to a Jewish mother but baptized in the Orthodox Church — is a troubling reminder of vulnerability as members of a relatively affluent minority with a history of being scapegoated, strong ties to the West and a deep attachment to cosmopolitan values and human rights. The murder hit Russia’s sizable Jewish intelligentsia particularly hard because “nearly all the leaders of the liberal opposition are either fully Jewish or have Jewish background,” said Michael Edelstein, a lecturer at Moscow State University and a writer for the Jewish monthly magazine L’chaim. If a Jew is not far from another $hoah, then they are one step away from yet another “pogrom” in the Shtetl. Oy veh, it is just like it was in the Jewish play — Fiddler on the Roof. Shtetls were small towns with large Jewish population which existed in Central and Eastern Europe, and were mainly found in the areas which constituted the 19th century Pale of Settlement in the Russian Empire (Russian Poland), the Congress Kingdom of Poland, and Galicia and Romania (Austrian Poland). The research body with Russia’s Security Council will soon present a detailed plan of action aimed at preventing forced regime changes through mass unrest, known as the “color revolutions,” a popular daily reported. The research center is headed by the Security Council’s secretary Nikolai Patrushev, who was the director of Russia’s Federal Security Service, the FSB, between 1999 and 2008 – during Vladimir Putin’s first two presidential terms. According to Kommersant daily, the center is in charge of evaluation and forecasting various external and internal threats that could affect the country’s socio-economic development and national security. The newspaper quoted an unnamed source close to the top law enforcement command, saying that Russian officials are taking the threat of a “color revolution” in the country more seriously, and the issue will likely be on the agenda of the nearest session of the Security Council dedicated to international relations. The Security Council prepared a list of proposed measures that could negate the possible threat. The daily quoted one of the experts, former security officer and now a professor at Moscow State University, Andrey Manoilo, who said the council supports a complex approach to the problem that would include measures against “network protest activities” and propaganda work against “romantic revolutionary stereotype,” which attracts a lot of people in the protest movements. “Any color revolution presents itself as a natural manifestation of the people’s will, while in reality it is a chain of actions pre-planned from abroad on a very precise pattern. We can fight it only by breaking the technology chain,” Manoilo told reporters. President Vladimir Putin again addressed the dangers of color revolutions at Wednesday’s session of the Interior Ministry’s committee. “The extremists’ actions become more complicated. We are facing attempts to use the so called ‘color technologies’ in organizing illegal street protests to open propaganda of hatred and strife on social networks,” he said. In November last year, Putin named color revolutions as a main tool used by forces that seek to reshape the world. “In the modern world extremism is used as a geopolitical tool for redistribution of spheres of interest. We can see the tragic consequences of the wave of the so-called color revolutions, the shock experienced by people in the countries that went through the irresponsible experiments of hidden, or sometimes brute and direct interference with their lives,” the Russian leader said. Putin also noted in his speech that everyone advocating the freedom of assembly and expression must remember the responsibility that comes together with these rights. However, Vladimir Putin has repeatedly stated that the fight against extremism must not turn into a campaign against dissidents. “All people have the right to suggest solutions for and approaches to current problems, and they have the right to form parties and groups, to participate in elections and fight for power,” Putin told the Security Council members in November. “The most important thing is to ensure that the process of realizing citizens’ political preferences is civilized and strictly within the framework of the law,” he said. The 18th century partition of Poland between Russia, Austria-Hungary, and Prussia did make many Polish Jews subjects of the Czar and the “Pale” was delineated to prevent further eastward migration of Jews, who were seen as something of a threat to Russian peasantry because of their penchant for the liquor trade, their simultaneous usury and their resistance to integrate into the largely agrarian society that was 18th and 19th century Russia. The boundary of the “Pale” was well east of any lands that were even remotely Polish. Galicia or more accurately, Halych, since Galicia is actually in Spain, was transferred to Austria-Hungary even though ethnically it was overwhelmingly Russian, or Malorussian but with a sizeable Polish landed aristocratic presence who preferred to be under the Catholic Hapsburgs rather than the Orthodox Romanovs. Incidentally, the current murderous and illegitimate “Ukrainian” junta and its National Guard thugs derive from this region of Halych. Romania and Moldavia are old kingdoms and principalities which date to Roman times whence their language and ethnicity. Of old they were called Walachs, or Vlachs, who resisted both the Ottoman Porte and the Austro-Hungarians. The famous or infamous Vlad the Impaler was such a Walachian prince or king, depending on the source, who inflicted some serious beating upon the Turks. Anyway they were, and are Orthodox, fiercely independent and never a part of any kind of Poland. The Jewish presence there was far smaller, than that in Poland, transitory in nature and confined to the commercial centers along the Danube, and whose size has remained small even unto this day. End of quibble. I don’t care at all for the title of this thread. The world is unimaginable with Putin incapacitated (as some rumors are intimating). I shudder at the thought. He is the only counterforce alive today. The Tschetschenia [Chechnya] angle is not as weird as it may seem at first sight. There is a lot of unrest in that place, because half of the people want independence from Russia, the other half wants to maintain the status quo, give or take a few percents. It is a well known fact that where there is unrest, humanistic and peace-bringing organisations like CIA and Mossad are soon to be found meddling in the morast to peddle their wonderful views of democracy (speak: dictatorship of plunderers and thieves). And in areas of this kind you cannot easily use field agents with blond hair and blue eyes as their half time life would be blown out in less than half time. They are better suited to serve as contacts from safe embassy grounds with the local network consisting of…right, locals. Now given the limitless hatred of the rebellious part of the Tschetschenian population against anything Russian in general and Putin in particular, it wouldn’t be all that difficult to dig a few people to be sent on an assassination trip to Moscow, especially when told that it would hurt Putin real bad, with the patsies believing to act in “Tschtschenian interest,” whilst in reality performing a CIA job? Reminds a little of the poor fellows, who were hired regarding 7/7! And there can be no question, Tschetschenian “rebels” have done worse things in Moscow than just executing one particular individual, haven`t they? Two weeks before the assassination the victim has been caused by somebody (guess who) to inform opposition media people in Russia that he fears to be killed by Putin. The question that arises from this is: Would anybody who says something like that and really believes it, hang out at deepest night-time around the house of the person he believes to be his potential killer? Or might it be that his pretty girl friend from the Ukraine has invited him for a romantic walk through the attractive camera- and concrete-infested area around the Kremlin? Nobody knows for sure what happened, but I dare to finish my thoughts with the beginning: The Tschetschenia angle is not as weird as it may seem!